Vitharn is a ruined village at the southern middle of Madgod's Boot in Shallow Grave (quest-related). 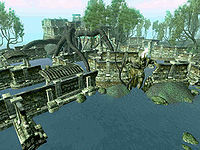 It contains five zones: Vitharn Sump, Vitharn Reservoir, Vitharn Keep, Vitharn's Mausoleum, and Vitharn Bailey. Vitharn was overrun by its own brethren three generations after its founding, and because of the cowardice, inaction, and incompetence displayed by the defenders, the ghosts of the residents were cursed by Sheogorath to relive their battle over and over for eternity. For more information about Vitharn, see the Lore article. Two test zones related to this ruin did not make it into the final game. 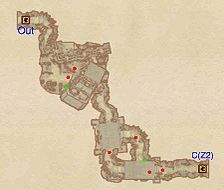 "XPVitharn" is the console code for an entirely empty zone, while "XPVitharn05" leads to an Ayleid Ruin-like zone with no exits. This settlement contains 3 Root Stalk plants and 24 Withering Moon plants. This location's map marker (M on map) is named Vitharn (editor name SE32VitharnMapMarker). The entrance door is S of the marker, 220 feet away. The first time you enter this zone, the related quest will be active, and you will encounter three hostile Ghost Fanatics, an archer included. The first ghost can be found in the first room, right next to the Hollowed Stump (green dot on map), while the archer ghost can be found when the root tunnel splits in two. The third ghost can be found under water, near the entrance to Vitharn Reservoir at D.
Upon arriving from door C, swim to the surface and examine the tunnel ceiling for an Amber Limb at H and a Hollowed Stump. Proceed forward and notice the big, inaccessible door at Out, apparently 'held shut by a supernatural force'. 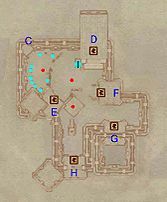 Pry open the nearby chest for some minor loot and proceed forward through the tunnel until you reach door D, leading into the ruin of Vitharn Keep. Upon entering the keep, you will be approached by the ghostly reincarnation of Count Cirion (J) who will fill you in on the curse cast upon the residents. Note that insulting the Count will make him lock the door at D, leaving you with no other choice but to help lift the curse before you can leave. Inside the central room you will find several ghost citizens carelessly feasting while complaining about the noise from the battlefield. 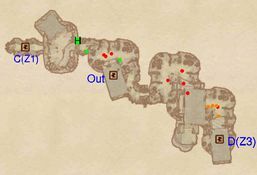 Start exploring by taking the western path and pick up the armory key from the table at k. Proceed to a small chapel and press the switch (cyan dot on map) to lower the secret wall at P. Pick up the Dagger of Depletion from L and loot the unlocked jewelry box on top of the shelves. 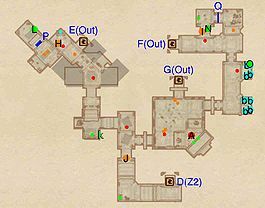 Return to the central room and pick the eastern path. Locate Desideratus' Doll (O) in the second sleeping area and proceed forward until you encounter over-protective armorer Bat gro-Orkul at I. Unlock the armory door at Q (either by lockpicking or by using the armory key) and sneak into the armory. If you are noticed by Bat, he will immediately teleport you outside, so make sure to make effective use of your sneak skills. 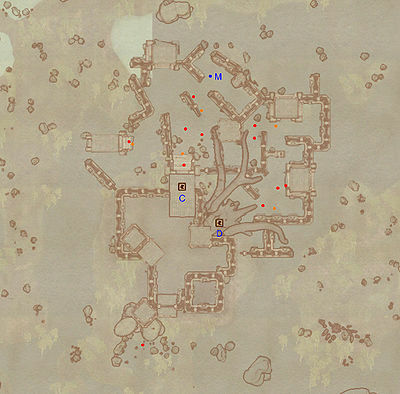 Claim Althel's Arrows from the table at N and leave the same way you came. It is finally time to enter the cursed battlefield, so use either door E, F or G and enter Vitharn Bailey. 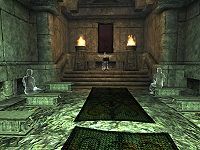 The Mausoleum is the final resting place for the ancestors to the last ruler of Vitharn, Count Cirion. It contains several coffins for the deceased nobles, all of them with a chance of containing some jewelry and minor loot. In the center of the room sits a brazier (E), similar to the one in Vitharn Bailey. In the western wing are the coffins for Countess Sheen-In-Glade and Count Csaran Vitharn, separated by a glass display with jewelry, all at C. The eastern wing contains coffins for Countess Jideen and Count Cesrien Vitharn, with a bit more jewelry at D. The southern wing contains open coffins for Countess Mawean and Count Vitraen and, on the ledge underneath the ceiling, some ghostly Welkynd Stones. 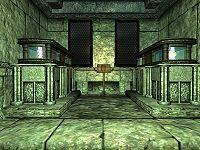 Several unnamed coffins can be found in the many alcoves, so make sure to loot it all as the Mausoleum will be sealed off upon completion of the related quest. Count Vitraen Herein Interred Lies Count Vitraen, Primogenitor of the Keep and Nobility of Vitharn. Countess Mawean Herein Interred Lies Countess Mawean, Mother of Vitharn. Countess Sheen-In-Glade Here lies Countess Sheen-In-Glade, Matron Scholar of Vitharn, and Ambassador of Black Marsh. Count Csaran Vitharn Here lies Count Csaran Vitharn, to whom the Love of family meant so much. Count Cesrien Vitharn Here lies Count Cesrien Vitharn, Noble conqueror and just leader of our people. Countess Jideen Here lies Countess Jideen, Lady of color from whom we all had so much to learn. Vitharn Bailey is an outdoor area, but all available exits will be sealed off by supernatural forces. When you arrive, everything is in a state of chaos as the exact same attack will repeat itself over and over again, in turns causing the deaths of Hloval Dreth, Desideratus Annius and Althel along with a bunch of unnamed Vitharn Solders; Devoted Ghost Fanatics will attack in waves, first from Vitharn Reservoir through gate H, then from the outside area through door D. All defenders will die over and over and it is up to you to use the items found in Vitharn Keep to release the soldiers of their eternal torment (please see the quest page for details). 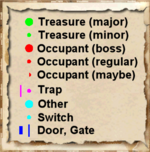 Note that door C to the Mausoleum will be locked once the quest is completed, so make sure to explore it now. After the quest, when Count Cirion thanks you personally, all ghosts will disappear, the initially sealed gates at D and H will be opened and the sun will start to shine over Vitharn. A small graveyard stands in a corner of Vitharn Bailey. Some of the citizens have tombstones there and their inscriptions may be read in a similar way to those in New Sheoth Graveyard. Althel Rest in peace, Althel. You were valiant to the end. Bat gro-Orkul Bat gro-Urkul [sic] was a miser. Upon his head lies a measure of the blame for Vitharn's fall. Desideratus Annius Desideratus Annius lies here, coward and deviant. Hloval Dreth Power mad to the end, Hloval Dreth met his end in shame. Unknown Soldier An unknown soldier lies here. He died attempting to save his keep. Unknown Citizen An unknown citizen lies here. He was slaughtered while others held the defense. This page was last modified on 27 September 2018, at 06:46.